Wattco is a manufacturing company that develops electric heating products for use around the world, since 1969. With uncompromising dedication to our customers, we offer solutions and not just products. Our development in the oil and gas industries, renewable energy, HVAC systems and government projects help our customers like you to get alternative solutions for your projects in the most cost efficient way. We pride ourselves on our fast delivery and customer service. Wattco manufactures the following heater types: Immersion, Circulation, Inline, Flanged, Screw, Pipe, Over the Side, Boiler, Tubular, Finned Tubular, Strip, Finned Strip, Cartridge, Band, Silicone Rubber, Open Coil Elements, Duct, and Infrared Radiant heaters. For information on these heaters please see below. Circulation Heaters also known as "in line heaters" made up of different materials depending on the application. They are designed to heat pressurized circulating fluids to provide effective, controlled heating to water, oil, steam and other gases. Circulation heaters are composed of all-in-one units with a heater mounted inside an insulated tank. 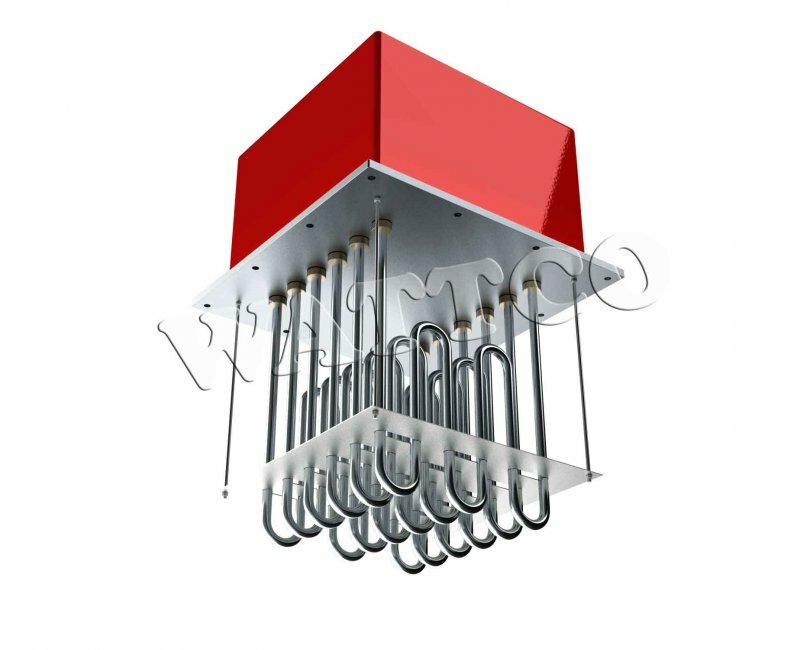 They are made of a flanged or a screw plug immersion heater that is inserted into a pressure vessel or a pipe body. These heaters have inlet and outlet piping where the liquid or gas goes through the tank in order to reach the desired temperature. For more information on Wattco Circulation Heaters please click here for our brochure. These heaters contain consist of hairpin tubular elements that are brazed or welded into a machined pipe thread fitting, which are then screwed directly through a threaded coupling in the tank wall or vessel, or installed in pipe. Screw plug heaters are an easy way to heat up solutions in smaller containers that also require controls. For more information on Wattco Screw Plug Heaters please click here for our brochure. Flanged heaters use bent tubular elements that are brazed or welded onto a flange. Extra wiring boxes in which the electrical connections are fixed are provided with these heaters. Usually heaters have already been prefixed into flanges, our custom units can be welded on matching flanges that are mounted on a nozzle or tank wall. Wattco offers flanged heaters in varying kilowatts ratings, voltages, temperature ranges, sheath materials and so on. Flanged immersion heaters are one of the most widely used industrial heaters used. 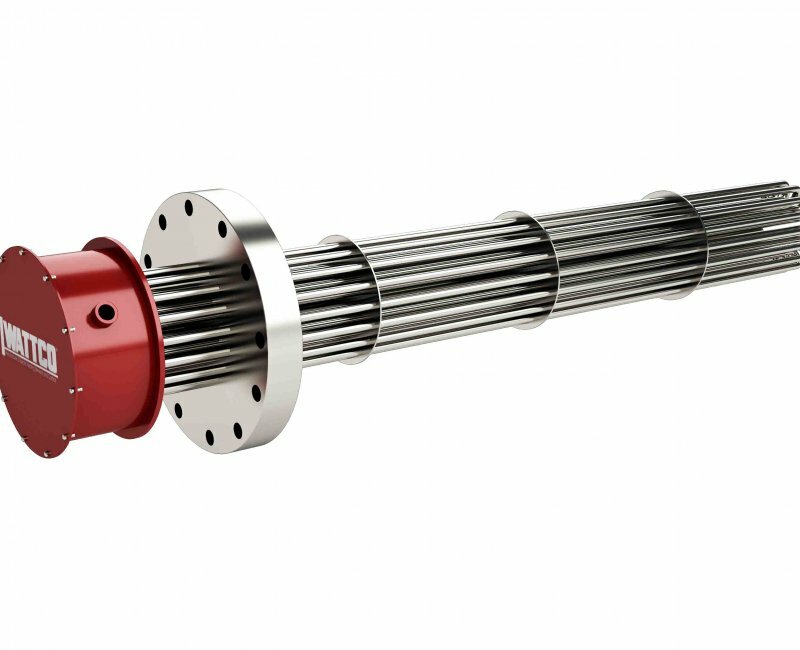 Compared to other oil heaters, they are easier to install, are specifically designed for use in pressurized vessels and more manageable. Typical applications include preheating different grades of oil, cleaning tanks and heat transfer. For more information on Wattco Flanged Heaters please click here for our brochure. 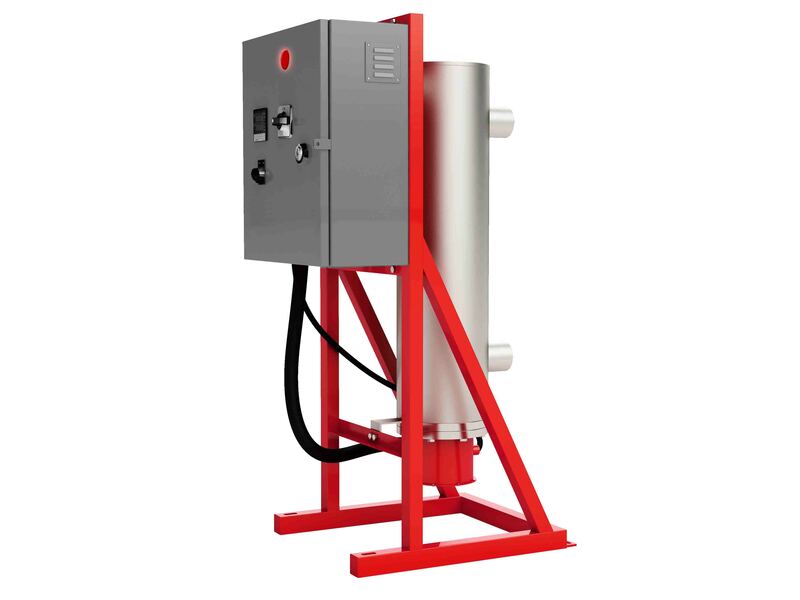 Over the side immersion heaters are specifically designed that they can be installed in the upper portion of tanks. The substance to be heated is either below the heater or onto one side, (hence the name). 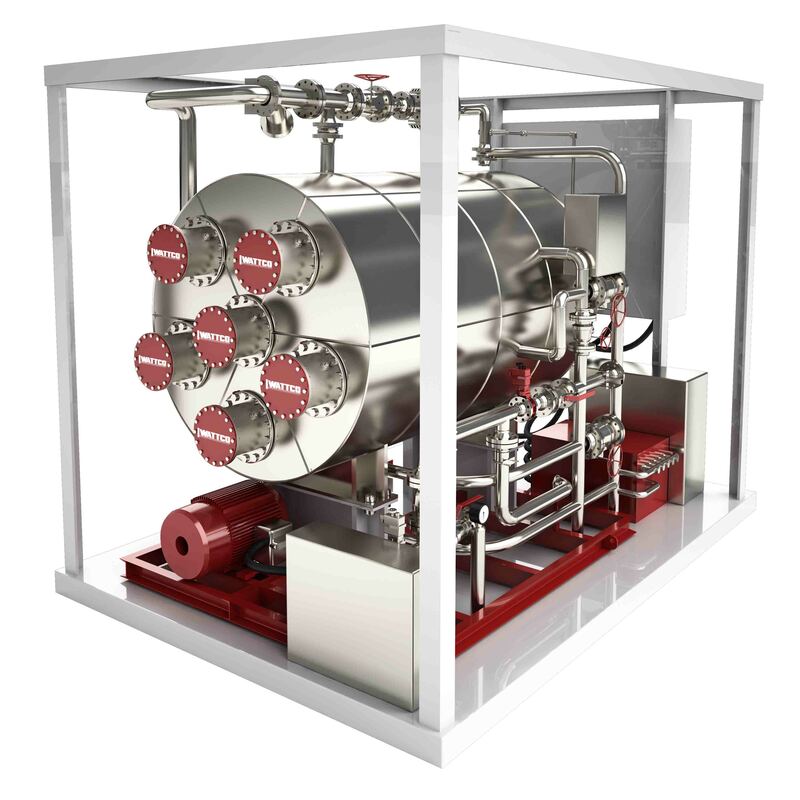 The main advantages of this approach are that ample space that is left in the tank for other operations to take place and the heater can easily be removed when the required temperature is achieved within the substance. The heating element of an over the side process heater is usually made from steel, copper, cast alloy and titanium. A coating of fluoropolymer or quartz can be provided for protection. Duct heaters come in various sizes and dimensions to fit any compartment. There are three types of duct heaters available: open coil, tubular or finned tubular (heating elements that are either flanged or inserted in the duct). Air duct heaters are primarily used in air flowing ventilation systems and comfort-heating applications. Process duct heaters are mainly used for industrial process heating applications (ovens that require re-circulated air or forced circulation). For more information on Wattco Duct Heaters please click here for our brochure. 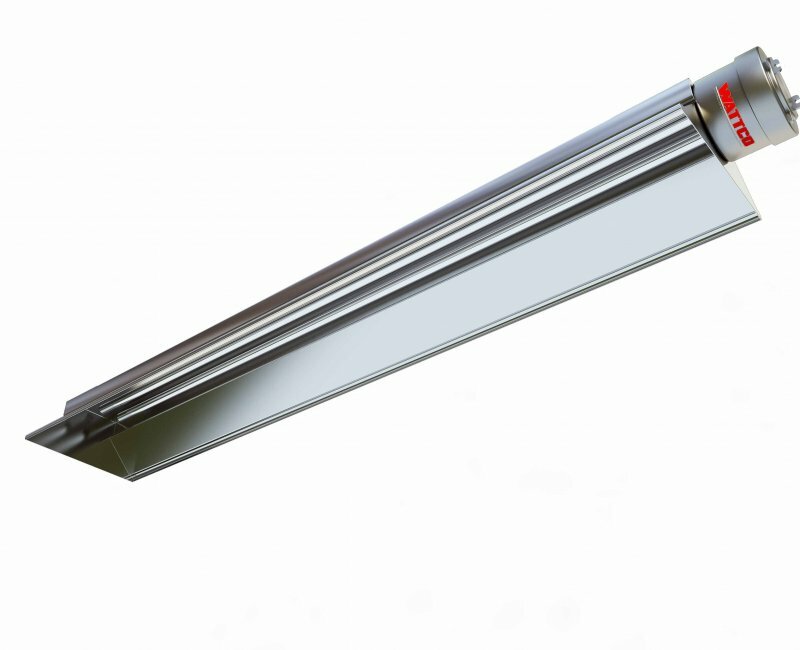 Infrared radiant heaters are economic, efficient, and clean. These heaters are designed for comfort heating applications that require radiant heat indoor, outdoor, and exposed areas through direct infrared heat transfer. Infrared industrial heating products use tubular heaters that reach high temperatures and radiate sufficient heat from overhead. Infrared heaters come in many different lengths and sizes. Waterproof housing is available to help protect terminals from humidity and moisture penetration and, are used in conjunction with digital or mechanical control panels. Wattco infrared heaters use high-grade stainless steel throughout along with protective wiring to help maintain lifelong usage. Applications: Indoors such as retail locations, car washes, arenas. Outdoors such as patios, parking decks, or walkways. For more information on Wattco Infrared Radiant Heaters please click here for our brochure. Open coil elements are the most efficient type of electric heating element.Used primarily in the duct heating industry, open coil elements have open circuits that heat air directly from the suspended resistive coils. These industrial heating elements have fast heat up times that improve efficiency and are designed for low maintenance with inexpensive replacement parts. 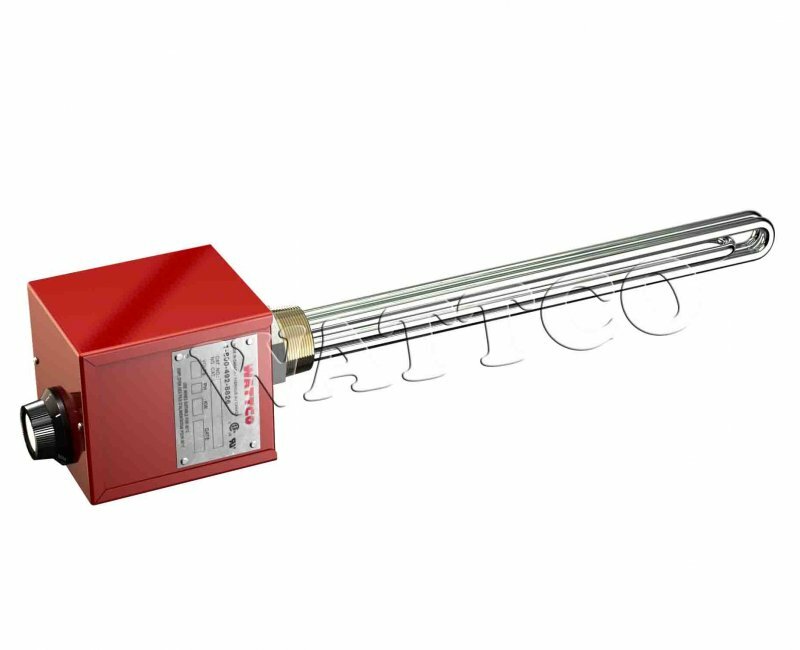 Open coil heater elements are made to fit inside standard 2’’ or 3’’ schedule 40 NPS pipe. Open coil heaters are also used in tank and pipe heating and/or metal tubing. A minimum clearance of 1/8’’ is required between the ceramic and the inside wall of the tube. Installing an open coil element will provide excellent and uniform heat distribution over a large surface area. For more information on Wattco Open Coil Heaters please click here for our brochure. 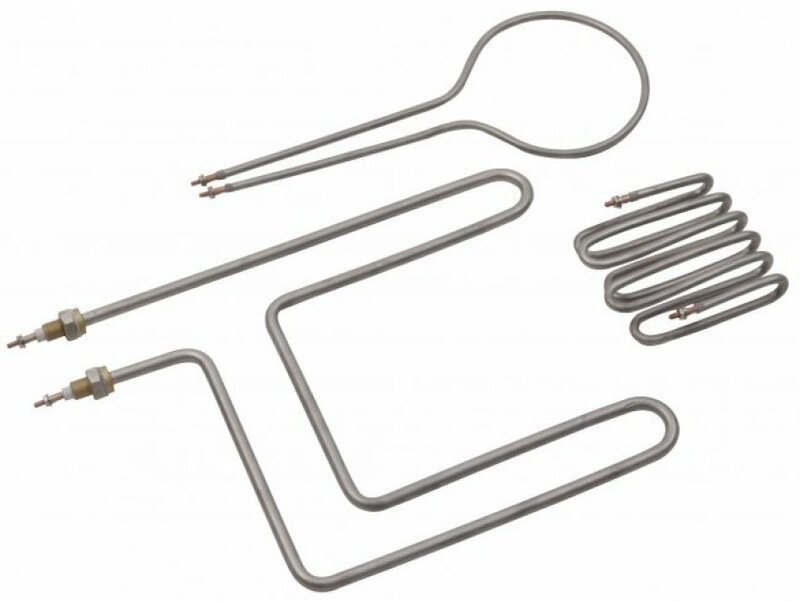 Tubular heating elements are the most versatile industrial heating solution for a large number of applications. These elements are factory-configured to almost any shape or size. Custom bending diameters and layouts can be made upon request. Tubular heaters are typically made using steel, stainless steel, Incoloy, inconel or titanium alloys. 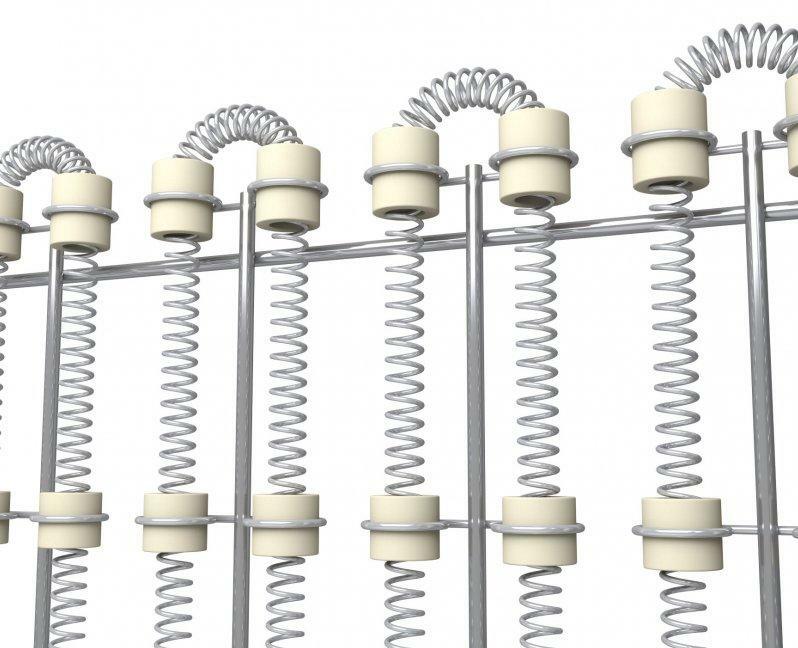 Tubular elements are often regarded as the foundation of all heating elements. These heating elements have a strong outer sheath to help protect the process heater from physical stress and uses high quality alloys to allow efficient heat transfer from resistance coil to your heating medium. Standard and custom made terminal pins allow for easy installation and maintenance. Wattco uses high quality magnesium oxide to allow for efficient heat transfer from resistive coil to your heating medium whether it is air, liquid or solid. Bending radiuses are designed with careful expertise to allow for optimal performance when meeting "form fit and function" within your application. For more information on Wattco Tubular Heaters please click here for our brochure. Industrial control panels are used to regulate temperature and provide safety mechanisms to prevent overheating of your application and protect your heating elements. Control panels come in many different terminal boxes - standard NEMA 1 terminal boxes, dust proof boxes, waterproof boxes and explosion proof boxes for hazardous areas. 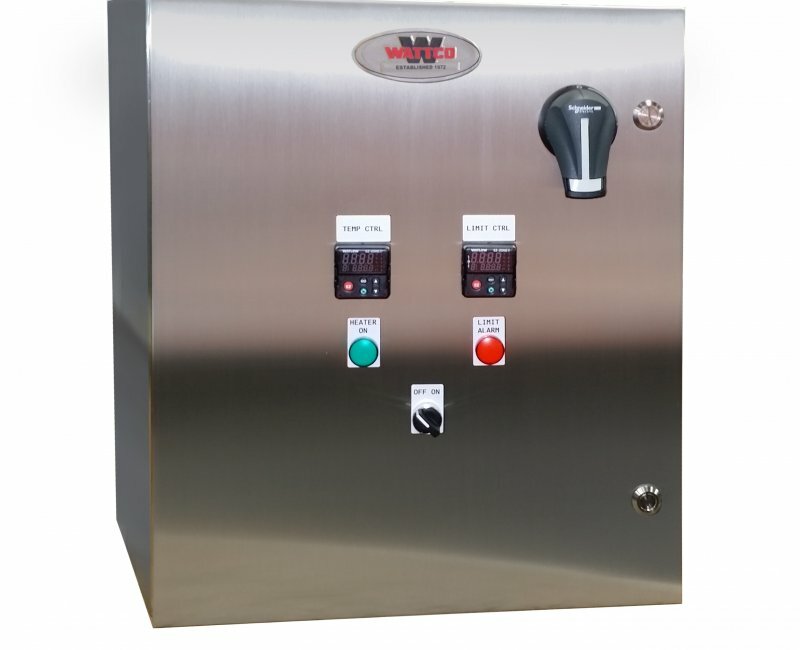 These control panels contain digital controllers.contactors, relays, fuses, on/off disconnect switches, thermocouples or RTD sensors, temperature controllers and other components to help regulate your Wattco heater in a safe environment. Heating control panels are typically available for heaters generating at least 30 Amps to over 200 Amperes. Special accommodations can be made for systems that are over 200 Amperes. We can also provide NEMA 4 terminal panels. These panels are typically used for outdoor applications where concerns of moisture and humidity is a factor. All Wattco control panels come with circuit schematics as well as support. For more information on Wattco Control Panels please click here for our brochure. Need a specific item in a hurry? Many units and spare parts in stock.